Is this Sydney’s most delicious, and elaborate, high tea? Bronwen Gora endeavours to find out. 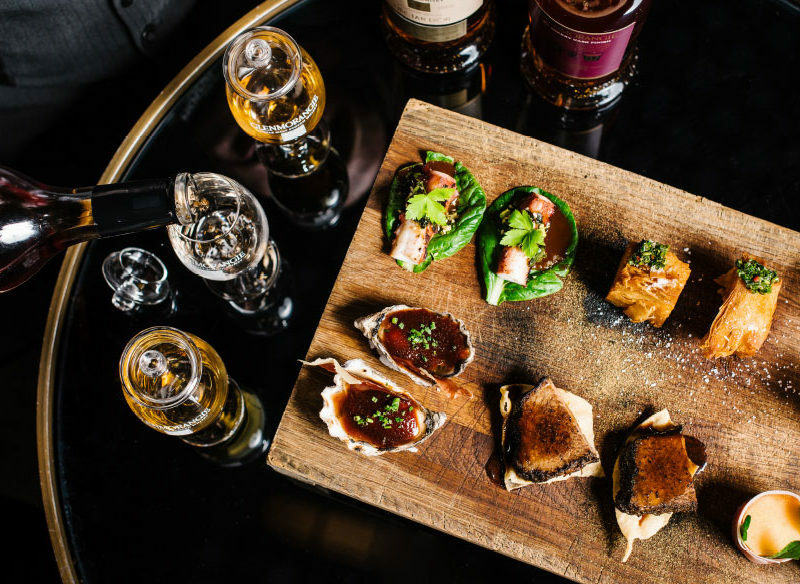 Sydney’s ultimate high tea menus have arrived, ‘his and hers’ options complete with Vegemite-laced wagyu, champagne-infused gravlax and plenty of French bubbles, fine whisky and, of course, tea to wash it all down. This decadent experience comes courtesy of the city’s five-star Primus Hotel, and it’s made even more special thanks to the combined genius of executive chef Daniel Menzies and head pastry chef Andria Liu. Together, they have re-fashioned regular high tea fare into a range of unique creations that match perfectly with the textures and flavours of champagne and whisky. The high teas also match their grand surroundings in the Lobby Bar of the Primus Hotel, which is housed in the Art Deco splendour of Sydney’s heritage-listed 1930s water board building. The enormous Lobby Bar is one of its most impressive features, with eight-metre-high red scagliola marble-look columns, soaring ceilings, panelled sky lights, potted palms and low lounges. I could have worn a 1930s vintage dress and mum’s genuine fox stole and felt perfectly at home. The Madame Clicquot High Tea at the Primus Hotel, Sydney. The Madame Clicquot High Tea marks the 200th anniversary of Madame Clicquot’s Rose Champagne. It begins with a sip from a glass of her finest and plump Sydney Rock Oysters served with Veuve Clicquot granita. This pairs perfectly with elegant sandwiches filled with oh-so-delicately slivered cucumber, just the right amount of crème fraiche and a sprinkling of chives. Next is a gravlax of Ōra King salmon from New Zealand, a delicacy chosen for its ranking among the world’s finest fishes thanks to an oil content so high its fat content sees it compared to wagyu. Chef Menzies improves even further on this quality by infusing the Ōra King salmon’s marinade with Madame Clicquot’s champagne to make it even softer and more succulent. Teamed with caviar and squid cracker, it is divine. We reach again to the platter, this time retrieving confit duck rillettes with pickled cherry, another clever pairing designed to complement champagne, with a crunch added by thin Melba toast. Delicious treats from the the Madame Clicquot High Tea at the Primus Hotel, Sydney. Feelings of impending fullness are overridden by the culinary artistry still begging for attention: a crab and corn beignet with calamondin, a citrus fruit that until now I did not know existed. The cross between mandarin and kumquat gives a sweet/sour spark that matches nicely with the fine drop in my glass, which by now looks like it needs a refill. Dessert destroys any desire to stop eating. It would be madness to miss a taste of tiramisu, a nibble of nostalgia-inducing raspberry Wagon Wheel, or ignore a yearning for yoghurt panna cotta with strawberry and honeycomb. There is even a version of vanilla cannoli, and a finale of lemon white chocolate scones that taste as comforting as they sound, especially when topped with rhubarb strawberry gin jam (where can I buy a jar?!) and Chantilly cream. The gentleman’s afternoon offering, Glenmorangie & Tea, also excels. In the same vein as Madame’s, most menu items are touched by the three whiskies on offer, Lasanta, Nectar d’Or and Quinta Ruban. Lasanta lifts the Kilpatrick sauce atop Sydney Rock Oysters, and a dish of wagyu brisket has its rich depth enhanced by a Vegemite-tinged Nectar d’Or infusion. Grilled octopus is enveloped with a chilli-spiced Quinta Ruban single malt sauce. Other choices include a mushroom consommé intensified by black truffle; potato galettes enlivened with native spices and chimichurri, and a trio of prosciutto, rockmelon and mint to refresh the palette. Tea or coffee anyone? How could we forget. From a list ranging between Indian chai to English breakfast and Turkish Apple, I choose a refreshing Matcha green tea to finish. My high tea partner selects a frothy cappuccino to carry her into the evening. Sated (and ever so slightly sozzled), these high teas have our vote. The Madame Clicquot High Tea and The Glenmorangie & Tea are served daily between 3pm and 5pm at The Primus Hotel, 339 Pitt Street, Sydney.